USB аудио конвертер Audio-gd DI-U8 - это последняя разработка компании в области цифро-цифровых преобразователей, базирующаяся на использовании последнего чипа от XMOS U8. Пристальное внимание в аппарате уделено питанию: используются 5 групп источников питания класса А на дискретных компонентах, поэтому использовать внешнее питание c DI-U8 не имеет смысла. The HE series products had the longest term of design and test in audio-gd history . Even though audio-gd had release the regenerative power supply products since 2006, and Mr. Kingwa had publish the article in the <Radio & TV> magazine explain the technology detail . The HE series products had finished the design in the New Year of 2014 , we were plan to release them in the date of audio-gd 10 anniversary , but for got the best sound quality and performance, we have even 3 times change the full design for made the compare, and compare different power frequency and voltage, create the longest design term record. The HE series products have better detail and dynamic reproduce ,blacker backstage ,better focus and larger sound stage , but the sound is better analog . The right saddle must is set on the right horse ,if you had not enough good system units, and had not enough cable match experiences, don't waste the money on HE series products. Separate class A PSUs power supply for regenerative drivers and audio signal amps . Uses 6 unit transformers (In total 2400W ) and more than 280,000uf audio grade capacitors are used to ensure ample and smooth power delivery. Full new ultra low distortion output stages design, Applies 80 pieces of ON Semiconductor “the King of transistors” MJL4281/4302. he HE series products had the longest term of design and test in audio-gd history . Even though audio-gd had release the regenerative power supply products since 2006, and Mr. Kingwa had publish the article in the magazine explain the technology detail . Uses 650W transformers and more than 100,000uf audio grade NOVER capacitors are used to ensure ample and smooth power delivery. Applies 24 pieces transistors ( in total had 3900W ) to drive the 650W output transformer for 350W AC power output. Class A PSUs power supply for regenerative drivers . While audio is life , the Power supply is water , Pure water create the wonderful life ,clean power supply reproduce the beautiful sound . The regenerative power supply like a proprietary electric generator built in the unit. It can block most disturb from the power line , supply the ultra clean power supply for the audio amps , reproduce the most neutral and analog sound like audio signal for the system and the users. In the regenerative power supply design, the AC power through the regenerative input transformer , conversion to DC power ,through the class A PSUs power supply for the regenerative wave generator and driver stages . 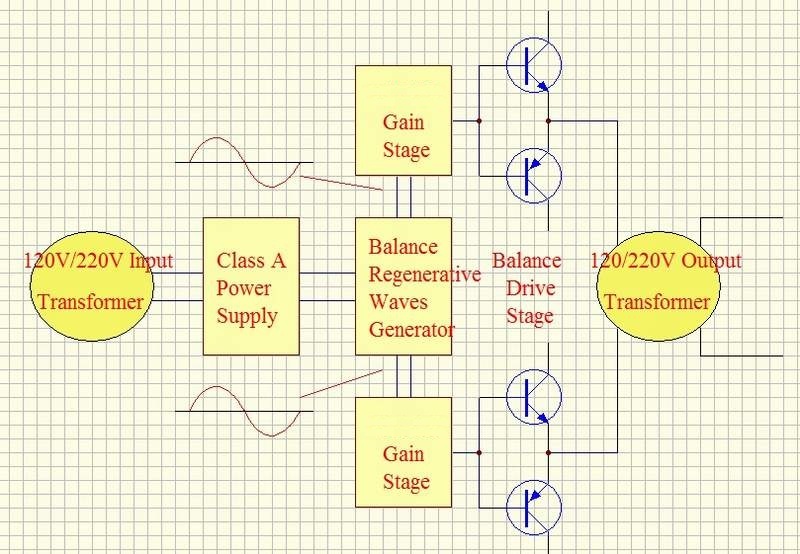 A balance regenerative regular wave generator produce the ultra low distortion 50Hz wave ,through the balance gain amps and the strong output stages , drive the regenerative transformers produce the clean AC power supply feed to the separate class A PSUs power supply for the L and R channel preamps . The class A parallel connection PSU has very high input impedance to avoid disturb through the PSU from affecting the signal parts and low output impedance with very fast speed and high linear, it is a very clean power supply. 1, Through analyzed the AP SYS-2722 , full analog design of the regular wave generator have much lower distortion than the digital generator. 2, Digital drive stages have higher efficiency , but full analog drive stages have much better analog sound like . 3, 400Hz regenerative wave have higher efficiency , 50Hz regenerative wave had much far away the human ears sensitivity area than the 400Hz, boost the sound have much better analog sound like. Uses all audiophile grade components, including DALE resistors, WIMA caps, custom order NOVER (UK brand) caps, all audiophile grade input & output sockets (Neutrik ) and gold IEC socket. HE-1 all parts of four channels had exact match before install. А богатый набор интерфейсом и функция USB-ЦАПа делают Luxury & Precision L3 интересным вдвойне, он круче и лучше старого L5 и первый плеер с качественной поддержкой DSD. The Master 2H applied the newest output drive stage design, which is same as the HE-2 . The Master 2H had assemble 80 pcs ON Semiconductor MJL4281/4302, larger power transformers and the caps, boost the drive ability achieve the monster level . The newest output drive stage design had the ultra low distortion , low to -120DB even with the normal listen volume , keep the sound quality had more transparency, clean, less coloration and dynamic . Fully balanced design, the gain stages and pre-driver stages work in class A and are built with discrete analog stages without any OPA or coupling caps in the signal channels. The output transistors stages work in high idle current state . The Diamond Cross output stage design avoids "switch distortion" as good as class A amps. Non- feedback ACSS analog amps. Applies 80 pieces of ON Semiconductor “the King of transistors” MJL4281/4302. Supports 250W X2 (8 Ohms) output. The capacitance of the whole machine reaches as high as 260,000 uF, Two 800W (Total 6000W) core transformers and two R core transformers , Separate power supplies for the right and left channels. A total of 4 groups of high-quality class A parallel connection PSU's supply the gain stages. Applies all audiophile grade components, including DALE resistors, WIMA caps, custom order NOVER (UK brand) caps, all audiophile grade input & output sockets and gold IEC socket. Applies the round-corner style chassis which has lower syntony, or vibration. Between the transformers and signal amps resides a thick metal board to avoid disturbance. Master-2H is a true balanced design applying the newest ACSS design which can improved the XLR connection to sound as good as the ACSS connection. It seems complex , but in fact they are the most simple design the world has ever had , their a lot components to process the power supply. The Master-2H power amp only has a single " voltage" gain stage to process signals, but works in ACSS mode so in fact it is a current gain stage instead of voltage gain stage, whereas normal OPA chips already include two or three voltage gain stages. The simplest and shortest signal journey brings out the most neutral and least colored sound. Master-2H applies ultra-low distortion single stage ACSS amplifier and soldered directly on the motherboard . The gain stages and pre-driver stages working on class A . The ACSS is a non-feedback technology made with fully discrete amplifiers. Most people know the global feedback design can offer better specs in test measurements, and non-feedback can't do well in test measurements but can offer better sound for the human's ears. Here is a conflict of the classic circuits. But the ACSS opens a new field, it can offer a least coloration sound which is more neutral with very low distortion and high linearity. So it can retain the dynamics, detail and neutral sound but not sound bright or harsh. All signal gain is in current, achieved by the unique, superb open-loop multiple output current mirror. Incomparably precise and ultra-low distortion in the gain signal is the result. The signal path is balanced throughout and all transistors work in class A mode. The ACSS parts use 4 groups of high-quality class A parallel connection PSU for dedicated DC supply. The class A parallel connection PSU has very high input impedance to avoid pulse from the PSU from affecting the gain stages, and low output impedance with very fast speed and high linear, so it is a very clean power supply. Massive use of high power parts and robust power supply guarantee vigorous current output that drives most existing loudspeakers. Master-2H applies four channels of diamond non-feedback output stages composed of 80 pieces of “the King of transistors" MJL4281/4302. The capacitance of the whole machine reaches as high as 260,000uF. Four transformers are used with total power of 1700W. Master-2H can input not only XLR balanced signal, but also the top grade ACSS current signal. No matter what kind of signal it is input, it is able to transfer it to current signal and amplify it. Master-2H uses heavyweight all aluminum alloy chassis to prevent the eddy current of transformers from interfering with the circuit board. The interior is separated into 3 sections with aluminum boards for the best separation off the ACSS parts, the output stages and transformers. The AC power wire is shielded by a copper channel from back to front. Master-2H take care the vibration for the best sound playback. Each channels gain parts under a 5MM thick aluminum board, these aluminum board not only poise the heat between cool and hot amps, our workers care to install all transistors cling the aluminum board for avoid the vibration cause the sounding worst. From our testing, with the aluminum board bring clear detail reproduce and less harsh than take off the aluminum board . Uses all audiophile grade components, including DALE resistors, WIMA & SOLEN caps, custom order NOVER (UK brand) caps, all audiophile grade input (Neutrik) & output sockets (CMC) and gold IEC socket. The output transistors are 80 pieces of “the King of transistors” MJL4281/4302. Master-2H has all parts of four channels exact-matched before installation. Бюджетный ЦАП ЗМ PCM — 500. Устройство довольно небольшое, но очень крепкое качество сборки корпуса. Внутри имеется ЦАП от Бур Браун 2704D (Burr Brown). Цифровой аналоговый преобразователь заинтересует меломанов и аудиофилов и всех тех, кто отчаялся искать устройство для прослушивания любимых альбомов в формате flac, ape, wav. Тем более за такую цену! Кстати, данный усилитель сделан не в Китае, а в России — ручная работа!! Sda-1-высокопроизводительный ЦАП, который был разработан нашей командой singxer для более чем двух лет назад. Это использует новейший чип серии xcore-200 в качестве USB-аудио-программы, флагманский ЦАП AKM третьего поколения в качестве основного микросхемы цифрового аналогового преобразования, ak4118 как цифровой аудио вход приемника чип, использование STM32 в качестве управления основной машиной, xilinx крупномасштабный FPGA в качестве тактовой системы и цифровой аудиопотоковой обработки. PCM до 384 кГц, DSD с использованием родной технологии прямого решения, до dsd512.Обладает насыщенными входными и выходными интерфейсами, включая стандартный интерфейс USB2.0, smdif и BNC коаксиальный и AES балансный вход, hdmiyi2s входной интерфейс, аналоговый выход XLR-балансный выход и RCA-одиночный выход; полный интерфейс поддерживает ввод DSD.